Well, this has been a pretty busy week, what with physics colloquiums at UCI and CSULB, trying out a new self aligning tripod for a camera and trying to resolve whether the image shown last week was really the Comet Catalina or not. So along that line of activity, I have some good news and some bad news. The first good news is it is always good to get back on campus, especially during this summer like warm spell and the colloquiums have been very interesting too. lightweight that I can carry it outside with one hand. It sets up in just a couple of minutes. This new tripod will track objects and remove the effects of the Earth's rotation, so I should be able to set up the camera and have it take an image periodically during the long night and just track the star. The self alignment feature didn't work too well in the light polluted observatory parking lot so a little darker environment might be necessary for best performance. The tripod alignment camera couldn't recognize any stars, but it worked fine when I picked a bright star and aligned on that. It should work much better in a little darker environment. The alignment with just one bright star will not be really accurate but it should work fine for the light curve data collection. Recall that my goal here is to take light curve data from stars, in this first test case light from Algol, which is a binary star system. The orbit of the stars results in periodic eclipses which result in lower light output, which is sufficient for even amateurs like my self to measure. It should be fun to collect the data and see the eclipse, which happens about every three days. 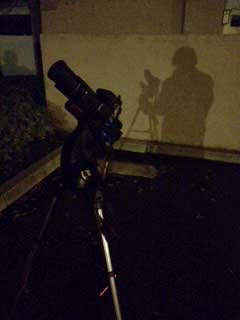 See the attached photo showing Resident Astronomer George, or at least his shadow, working the night shift with camera tripod. The shadow is caused by various street lamps and house lights. Yes, that is pretty polluted. Some more good news is that Astronomer Assistant Ruby is really growing fast and starting to learn that not everything in the observatory needs to be chewed up and is finally learned how to ask to go outside when she needs to take a walk. That is good news. That means we have a little bit more free time. 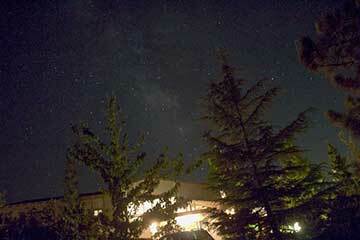 In fact Resident Astronomer, Peggy, has returned to her art and painting in addition to finding time for star parties. The bad news is that I can't take any credit for imaging the Comet Catalina because the fuzzy smudge of light is really M81 instead. 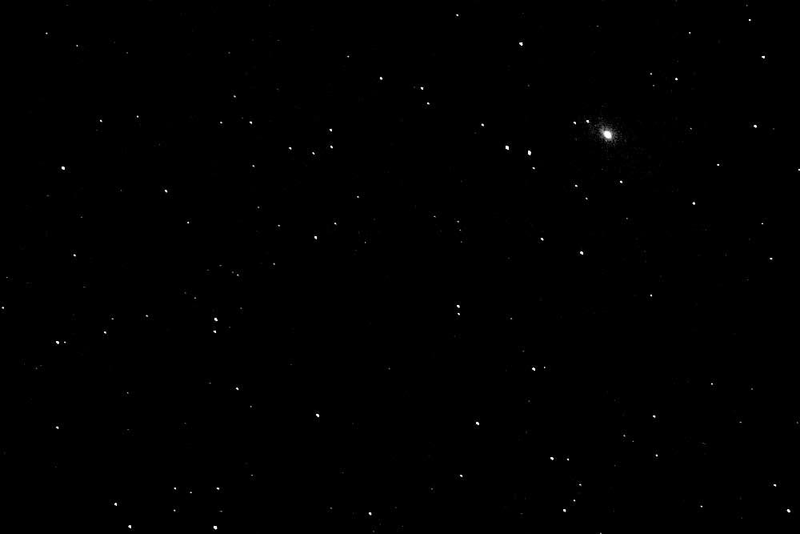 Based on the use of astrometric techniques learned in the last month, I'm now convinced that M81 was imaged and not Catalina. How was this done you ask? Recall from last time that I had measured the magnitude of the smudge and found it to be about magnitude 9. This is good because Catalina was also catalogued as about magnitude 9 also. The problem was that I could not get any overlap in the background stars in the image and the positions of stars from the catalog. Something was quite wrong, but what? Well, remember that I said I was so excited by the apparently successful telescope automatic alignment that I immediately tried to find Catalina rather than doing some quality control on the alignment. It turns out the alignment was off and not very accurate, which resulted in an error in telescope pointing by more than 20 degrees. I tried and tried to find the overlap in catalog stars, based on the assumption that the telescope was pointing toward the location of Catalina and could not find any possible overlap. I rotated the images, I stretched the images, I mirror imaged the images and I finally just gave up. Then, I asked OCA Secretary and Author, Bob, what might be going on. He suggested I use an astronomical website (astrometry.net) that accepts any sky image and provides automatic identification of which portion of the sky that image is from based on comparison with the background stars. Great! I tried that out and initially had no better luck there either. The alignments always failed and I tried various combinations of image formats, focal lengths, binning, etc. Then I gave up again and finally really came to the recognition that the telescope pointing must be in error. All this time I assigned a possible 5 degree error in the assumed position of the fuzzy smudge. When I increased the size of possible error to +|- 30 degrees and resubmitted the job, bingo, a successful matching overlap came back. 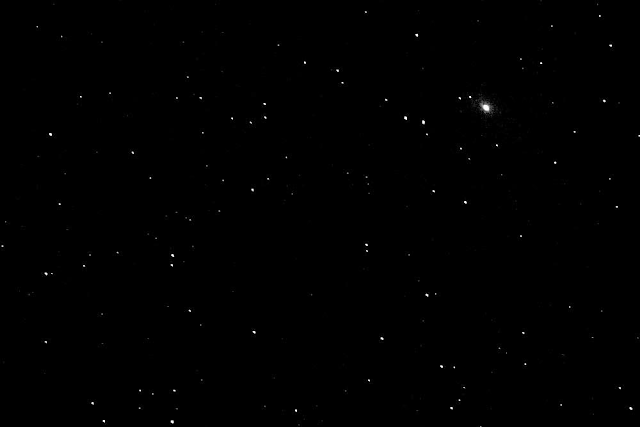 The original photo, with Catalina scratched out, some brightening added and a mirror flip to account for the telescope star diagonal, is renamed M81 and pasted below. So, with the use of science, some good luck and a good suggestion, we were able to resolve the question of whether or not the object was Catalina. As everyone knows who follows this blog, this gradual improvement in capability as the amateur struggles to move forward is a continuous saga of failure, and lessons learned and eventually a temporary success, until the inevitable new lesson opportunity appears.. So, getting a photo of Catalina goes back on the bucket list. But at least taking a photo of M81 comes off the bucket list. P.S. I forgot to mentioned one other pleasant event that occurred at the last Blackstar Canyon party. We met Just Barely a Teenager, Sydney, who was attempting to duplicate Roemer's experimental determination of the speed of light. He used the eclipses of Jupiter's moon, Io, and made a pretty good estimate of the speed of light. Pretty good for the year 1676. Any way, Sidney is following the details laid out in Secretary and Author, Bob's book on "Astronomical Discoveries You Can Make, Too!" This is the same book that I'm learning about doing the Algol eclipse project. Sydney uses her push around Dobsonian, without computer control and still finds her way around the sky and is busy collecting the eclipse data. I find it pretty amazing that even though the eclipses occur with very precise regularity, the varying distance to Jupiter causes a noticeable shift in the timing of eclipse observations. This is exactly like a Doppler shift and is calculated the same way. Depending how I wake up in the morning, I say it can't be possible to make this Doppler shift measurement, but it is really real stuff. Anyway, it was so neat to meet Sydney and see how much enthusiasm she brings to the field. I'm really impressed with her enthusiasm. Gee, and I think I'm on a steep learning curve.